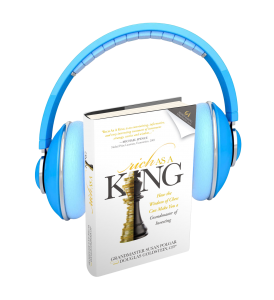 Rich As A King is now available as an audio book! Since Susan Polgar and I first published our book Rich As A King: How the Wisdom of Chess Can Make You a Grandmaster of Investing in October 2014. It has continued to grow into a weekly blog, podcast, posterbook, and is now available as an audio book! Download a free sample and “read” the first book to use chess strategies to improve your financial situation now! Want to try it out? Click here to download a free audio sample. If you like what you hear, buy your Rich As A King audio book here. The entire book takes around eight hours to listen to, so download it now and begin to apply chess moves to transform you into a grandmaster of investing! Join the readers/listeners of our book/blog and podcast, who come from countries as diverse as the United States, England, the Philippines, India, Israel, Nigeria, Ecuador, and more. And if you enjoy the audio book, leave a review on Amazon! Douglas Goldstein, co-author of Rich As A King: How the Wisdom of Chess Can Make You A Grandmaster of Investing, is an avid chess player, international investment advisor and Certified Financial Planner (CFP®), and enjoys listening to audio books.